Oil Fire Schools were held in the 1960's, 1970's and 80's. Pictured here include then Sausalito FD Captain Fred Bunker in the red helmet, and to his right then Asst. Chief of Kentfield Bob Mariani. "I will reflect mostly on training in San Rafael in the 1960's, when I was in the early part of my career. As with most departments, training was primarily done within each FD, and not with other fire departments. In San Rafael FD, the Captains were held responsible for the training of their crews. Sometime around 1965, San Rafael hired a full time Training Officer named Gaylord Bonfield. Bonfield had been hired from the Columbia Steel Company FD in Pittsburg in the East Bay, and was hired as a Captain at SRFD. Now with a full time Training Officer, the work took on a new dimension in San Rafael, with specialized training taking place on an array of topics. I believe Novato Assistant Chief Jack Kidder was the Training Officer in Novato at the time. Bonfield eventually became the Chief of Marinwood FD. I don't remember any training with other departments until the advent of the Fire Science program at College of Marin. If I am not mistaken there was a committee of the Fire Chiefs who advanced the notion that firefighters should have a higher level of training and knowledge. I know my father Chief Nello Marcucci of San Anselmo and Chief Vance Trivett of San Rafael were on the committee, and they were large supporters and initiators of the college program. Through the College of Marin and the Training Officers section of the Fire Chiefs, we began to see training on a county wide basis. The Oil Fire Control School was first organized between Bill Lellis and me. Buck Masten, then the Chief of Sausalito, was a great supporter of training. Buck eventually became Chief of El Monte in Los Angeles County. The college fire science program brought personnel from different departments together, with the resulting benefit of increased joint training. I remember courses in wildland fire investigation held in part on a hillside across from the Civic Center. Stan Rowan from Marin County FD and I went to the CDF Fire Academy at Ione in the early 1970's for the basic Incident Command System course, and began instruction of ICS in Marin. I also remember teaching a basic management class at San Anselmo FD Station 2 in Sleepy Hollow, when serving as a Battalion Chief in the late 1960's." "I took my first Fire Science Courses in 1970 at College of Marin. Introduction to Fire Science was taught by Captain Bob Mariani of Kentfield FD at the Kentfield Fire Station; Codes and Ordinances and also Hydraulics by Assistant Chief Bill Lellis of Larkspur FD; Tactics and Strategy by Captain Bob Beedle of San Anselmo FD, Fire Apparatus and Equipment by Captain Jim Berthinier of Novato FD, Fire Prevention by Fire Marshal Ken Mazza of San Rafael FD, Wildland Practices by Lt. Stan Rowan of Marin County FD, and Introduction to Fire Science taught by Captain and Training Officer Jerry VanSoest of Marin County FD, to name a few. Most of these instructors would later become Fire Chiefs. After completing my A.S. Fire Science Degree and 30-unit certificate at College of Marin in 1973, I began teaching for College of Marin in 1976 (Fire Hydraulics), and also taught later at the Indian Valley College of Marin campus (Rescue Practice and Introduction to Fire Science). In the 1970's San Rafael Chief Bob Marcucci and Larkspur Assistant Chief Bill Lellis organized Oil Firefighting Practices Schools through the Marin County Training Officers Association. With the help of Chief Jim Berthinier of Novato, then President of the Fire Chiefs, the TO's also produced a "Fire Service Practices" manual modified from IFSTA manuals for the use of FD's throughout Marin. 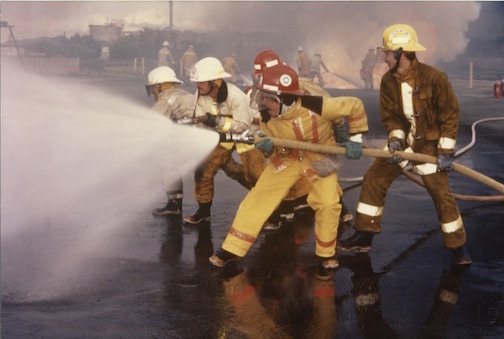 The MFTOA (Marin Fire Training Officers Association) in the 1970's & 1980's provided manipulative training in Structural Firefighting at Hamilton Air Force Base, Flammable Liquid Firefighting at San Rafael & at the Chevron Oil Refinery, Wildand Firefighting in Mill Valley above highway 101, and Forcible Entry-Roof Ventilation Practices at Corte Madera at the old Purity Market. Many other courses were also delivered such as Fire Arson Investigation; Trench Rescue taught by Ed Bent of State Fire Training; High Angle Rescue, and Dive Team Water Rescue by the U.S. Park Service & U.S. Coast Guard." In 1984, Fred was elected President of the MSFTOA. In 1988, a Firefighter I Academy was established and offered through Santa Rosa Junior College (SRJC), after College of Marin denied a request for a 4-Unit Firefighter 1 Academy. In 1989 the SRJC FFI Academy was approved by State Fire Marshal Chief James McMullen and the State Board of Fire Services as a Regional Firefighter One Recruit Academy.